Rajasthani people's love for food is clearly manifested in their culinary delights. 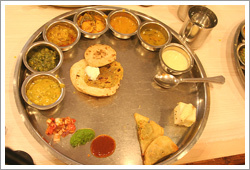 Food is one thing which every traveler wants to explore while on their tour to Rajasthan. Who would not be curious to relish the cuisine of the land of Maharajas. Rajasthani cuisine consists of a wide variety of dishes which originated from the cultural influences of several rulers. The ingredients used in the preparation of the delicacies are simple but the dishes are mouth watering. Cuisine was always a serious business in the royal kitchens of the erstwhile Maharajas. They employed the best of cooks and treated their guests with special dishes. And some of the recipes were even kept absolutely secret. Due to the dry topography of the land dishes developed were such that they could be used for several days. Camel milk and lassi or butter milk are considered quite healthy by the people of the state and hence are used in several dishes. Dried lentils and beans are extensively used here. Corn and bajra (they are highly nutritious) are used to make rabdi, khichdi and chapatis. Gatte ki sabzi, pakode, khata are cooked using the widely used essential ingredient Gram flour. Mangodi and papad are common in the state. The meal of people is incomplete without spicy chutneys which are prepared with coriander, chili, garlic, onion, mint and turmeric. Just like the Spanish people Rajasthanis are also fond of spicy food. Gatte ki sabji, dal bati and missi roti are the spicy dishes of Rajasthan. Fresh green chilies (rich in vitamin A and C) and dried red chilies serve as an important part of their food. They are even made into snacks, curries, pickles and chutneys. Relish the healthy appetizer before you dig into the food. The soup of legumes, made appetizing by adding red chili pepper and milk or curd. Some soup recipes also contain Okra, Jack fruit, Eggplant, Mustard or Fenugreek leaf to make them healthier. Rajasthanis are not only expert in making vegetarian dishes but are also skilled in cooking non-vegetarian delicacies. Lal Maans (red meat) and Safed Maans are the two famous non-vegetarian dishes of the state. The former is very spicy as it contains several spices and chilies whereas the latter one is flavored with almonds, cashew nuts and coconut. Spanish and Rajasthani dishes have several ingredients in common. There is a typical Spanish dish called 'Paelle' which is a rice dish cooked with rabbit or pork, similarly Rajasthani people prepare a dish called 'Khud Khasrgosh'(a rabbit meat cooked in a pit). The preparation entails skinning of rabbit and stuffing it with spices. Then it is wrapped in dough and cooked in a pit. This dish can be eaten with rice or bread. Other popular non-vegetarian dishes are 'Soola' or barbecued meats, marinated with vegetable, Biryani Rumi (rice cooked with mutton pieces and herbs). Camel milk tea can be enjoyed with a wide variety of Rajasthani snacks such as Bhujiya, bread bajee, bread bonda, breadfruit bajee, cabbage vada, carrot vada, chili bajee, mint pakoda, mushroom pakoda, onion bajee, potato bajee and the tasty French fries made of potato. Rajasthani people are well known for their sweet tooth. Almond and honey which is an important ingredient in Spanish desserts also occupy a prized place in some of the Rajasthani sweet dishes such as raabdi and laapsi. Kesariya Bhat (Rice cooked with saffron and sugar) are quite tempting. Most of their sweets are made from dairy products. Each region offers a specialty for example Dal bati Churma (it is famous all over the state) sweet ladoos from Jaisalmer and Jodhpur. Malpuas and jalebies from Pushkar, Dil Jani from Udaipur, Mishri mawa and Ghevar from Jaipur, Ajmer's Sohan Halwa , Mawa from Alwar, Tilpapadi from Beawar and much more. Rajasthan also has something special to offer when it comes to liqueur. Kesar Kasturi is prepared from high quality saffron, dry fruits, herbs, nuts, seeds, roots and 21 spices. Jagmohan contain 27 spices, Mawalin has 29 spices while Chandrahas contains 76 different spices. Kesar Kasturi has medicinal and curative properties. Which one would you like to have! Each bite of Rajasthani cuisine will give you a flavor of the rich culture of the state. Undoubtedly Rajasthan is the perfect place to gorge on a wide variety of cuisine high on nutritive value.